Germany: Adolf Hitler issues orders to dissolve the Social Democratic Party. 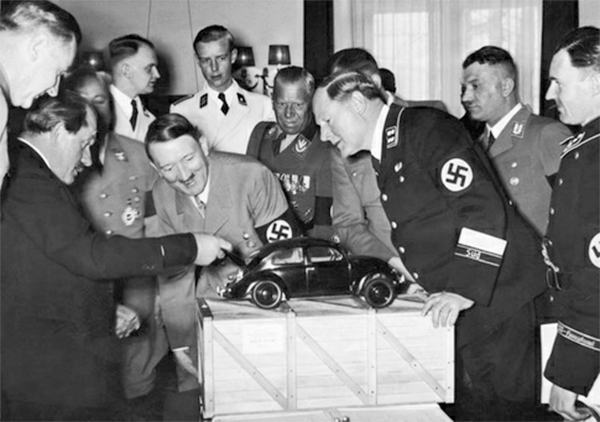 Germany: Ferdinand Porsche agrees to embark on Hitler's Volkswagen project, hijacked from Jewish engineer Josef Ganz. In a speech, Hitler announces his decision to put a car into production for all Germans behind the motto "the car should not be a privilege." In 1934, only one German out of fifty owned a car, as opposed to one American out of five. Adolf Hitler is said to have created the first design of the Volkswagen, sketching out a small car while he allegedly sat at a restaurant in Munich in 1932. Hitler told Ferdinand Porsche he wanted a car that would seat a family of four, go up to 100 kilometers per hour and get at least 14 kilometers per liter of gasoline. But it turns out that, like so many other things for which Hitler took credit, the seeds of the Volkswagen concept were deeply planted years earlier by someone else. 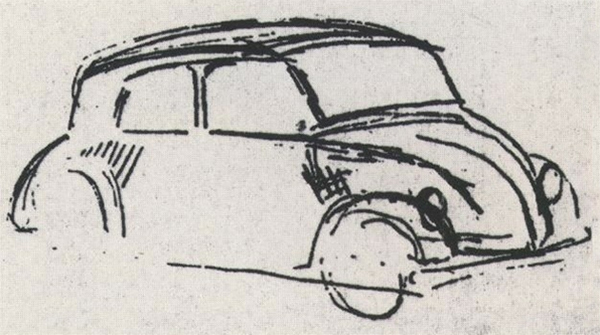 In 1929, Josef Ganz started contacting German motorcycle manufacturers for collaboration to build a small people's car, resulting in a first prototype, the Ardie-Ganz, built in 1930, and a second one in May 1931, nicknamed the Maikäfer ("May-Beetle"). Being Jewish, Ganz had no place in Hitler's anti-Semitic Nazi society. He was arrested in May 1933 on trumped up charges of blackmailing the auto industry, but was eventually released and fled Germany. Hitler and Porsche then scooped up Ganz' work to call their own. Ganz went to Switzerland where he started production of the Standard Superior. In this 1938 photo, Hitler is apparently amused to find the engine in the trunk of the car. Ferdinand Porsche can be seen on the left. The Nazis also instituted a Reich-sanctioned layaway program. Since few Germans could afford to purchase a Volkswagen outright, they could purchase stamps from regular payroll deductions and once they had a full stamp book, they could redeem it for a car. This generated badly needed cash, but once war came along, civilian vehicle production ceased. Military variants continued to be produced until 07 Aug 44. 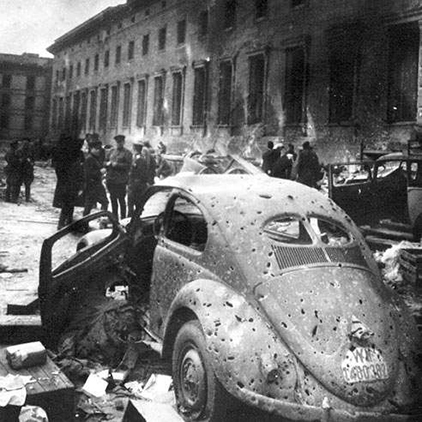 An estimated 650 pre-war Volkswagens were manufactured for members of the Third Reich during WWII. It is unknown just how many may have survived the war, but the number is sure to be quite low. Spain: Day 341 of 985 of the Spanish Civil War. 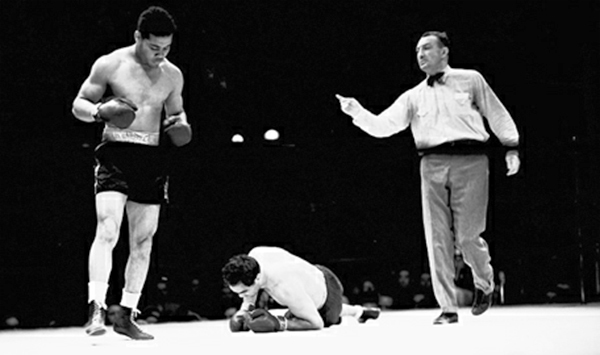 USA: Joe Louis defeats German boxing idol Max Schmeling in Yankee Stadium before a crowd of 70,000. Won by a TKO in the first round, FDR says, "Joe, we need muscles like yours to beat Germany." Among the more than 70,000 fans in attendance were Clark Gable, Douglas Fairbanks, Gary Cooper, Gregory Peck, and J Edgar Hoover. The fight drew gate receipts of $1,015,012. More importantly, the fight came to symbolize the struggle between democracy and fascism. Louis' performance in the bout elevated him to the status of the first true African-American national hero in the United States. When other prominent blacks questioned whether African-Americans should serve against the Axis nations in a segregated US Armed Forces, Louis disagreed, saying, "There are a lot of things wrong with America, but Hitler ain't gonna fix them." Joe Louis would go on and serve the United States Army during World War II, but he did not engage in battle while the war was going on. He mostly visited soldiers in Europe to provide them with motivational speeches and with boxing exhibitions. He routinely visited wounded soldiers in field hospitals, lending a compassionate ear and talking little about himself. For those soldiers, he was the real deal. Louis and Schmeling developed a friendship outside the ring, which endured until Louis' death in 1981. 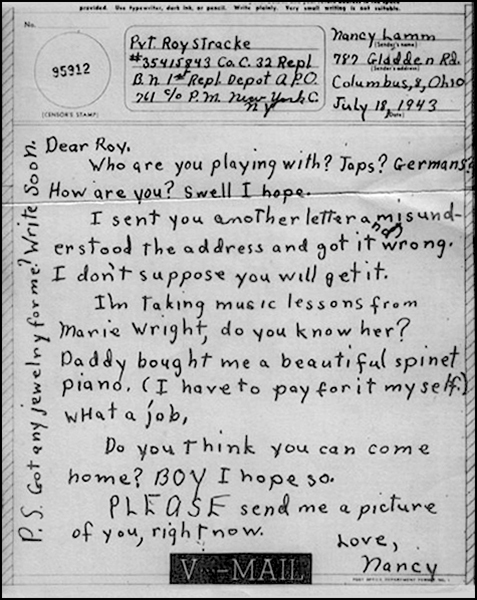 Schmeling reportedly sent Louis money in Louis' later years and covered a part of the costs of Louis' funeral, at which he was a pallbearer. Germany: Germany passes a labor conscription law that guarantees employment, but also removes job freedom. Spain: Day 706 of 985 of the Spanish Civil War. CBI - China: Day 351 of 2,987 of the 2nd Sino-Japanese War. Day 12 of 139 of the Battle of Wuhan. CBI - China: Day 716 of 2,987 of the 2nd Sino-Japanese War. Day 9 of 68 of the Battle of Tianjin. Day 2 of 7 of Operation SWATOW, the Japanese offensive to take Shantou in southern China. CBI - Mongolia: Day 43 of 129 of the Battle of Khalkhin Gol, a border dispute between the Soviet Union and Japan. ETO - France: Day 44 of 44 of the Battle of France. An armistice is signed with Germany near Compiègne. This treaty includes setting up the French administrative government at Vichy to govern all French lands unoccupied by the Germans. Meanwhile, France dispatches officials to go negotiate peace with Mussolini in Italy. Adolf Hitler deliberately chose Compiègne Forest as the site to sign the armistice due to its symbolic role as the site of the 1918 Armistice with Germany that signaled the end of World War One. He saw this as a supreme moment of revenge for Germany over France and decided to sign the armistice in the same rail carriage, which had to be removed from a museum building and placed on the precise spot where it was located in 1918. 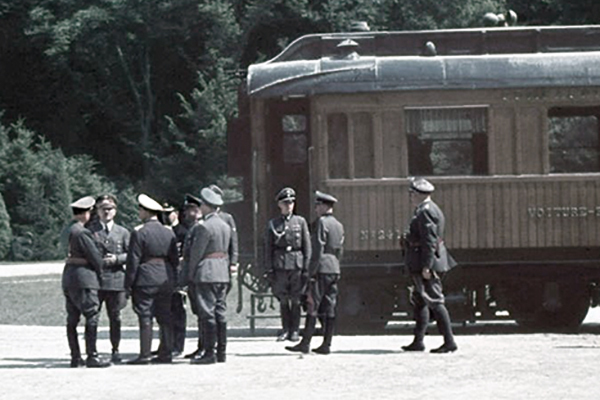 Most of the Armistice site was demolished by the Germans on Hitler's orders three days later, but the rail car itself was taken to Berlin as a trophy of war. But in 1945, the carriage was destroyed by SS troops and the remains buried. UK: The Second London County Council evacuation scheme is completed with 100,000 children moved to the West Country and Wales. Atlantic: German submarines sink two cargo ships and two tankers south of Ireland and in the Bay of Biscay. Atlantic: German sub U-122 goes missing in the Atlantic Ocean somewhere off of the British coast. The crew of 49 are never seen again. ETO - France: Charles de Gaulle broadcasts a speech from London on the BBC declaring himself the French leader in exile. He also coins the term "Free French." MTO - Egypt: The Italians bomb Alexandria. East Africa: Day 13 of 537 of Italy's East African campaign in the lands south of Egypt. CBI - China: Day 1,082 of 2,987 of the 2nd Sino-Japanese War. Day 221 of 381 of the Battle of South Guangxi. 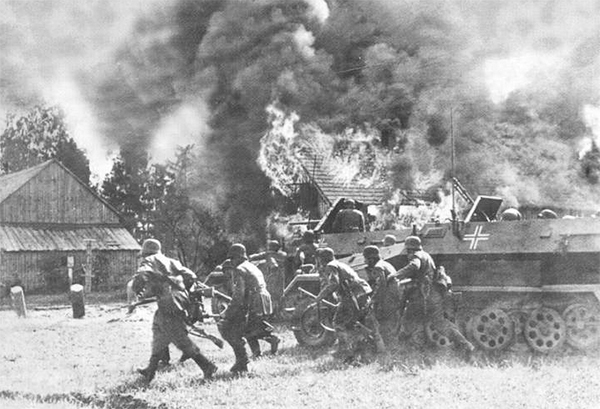 Russian Front: Day 1 of 167 of Germany's Operation BARBAROSSA, the German invasion of the USSR, the largest military operation in history in both manpower and casualties. Over four million soldiers of the Axis powers invaded the USSR along a 1,800 mile front, the largest military operation in history in both manpower and casualties. Tactically, the Germans won resounding victories and occupied some of the most important economic areas of the Soviet Union, mainly in Ukraine. But despite these initial successes, the Germans were eventually pushed back and defeated. Regions covered by the operation became the site of some of the largest battles, deadliest atrocities, highest casualties, and most horrific conditions for Soviets and Germans alike — all of which influenced the course of both World War II and 20th-century history. Atlantic: German sub U-141 sinks the Swedish ship CALABRIA 100 miles north of Ireland. Atlantic: German sub U-77 sinks the British weather ship ARAKARA 550 miles east of St Johns, Newfoundland. ETO: Churchill calls the German invasion of Russia "the fourth turning point of the war" and offers to give them whatever help he can. Romania: Jews from the Dorohoi district of Romania are branded as communists and spies and are transported by cattle cars to concentration camps in Tirgu and Craiova. Romania declares war on the USSR later in the day. Russian Front - Finland: In Operation RENNTIER, the Germans occupy Liinakhamari, Luostari and Petsamo, Finland. Russian Front - Finland: Day 1 of 164 of the Battle of Hanko. Without authorization, Finnish troops prematurely attack the leased Soviet naval base at Hanko. Russian Front - Center: Soviet authorities massacre political prisoners in Rainiai, Lithuania. Russian Front - Center: Day 1 of 12 of the Battle of Minsk, the German thrust into eastern Poland and Belarus. Russian Front - Center: Day 1 of 8 of the Battle of Brest, Russia. MTO - Italy: At about 3:00 am, Mussolini is awakened for an urgent message from Hitler's office, informing him of the invasion of the USSR. Although annoyed for not having been notified earlier, he dutifully declares war on the Soviet Union. MTO - Libya: Day 74 of 256 of the Siege of Tobruk. Middle East: Day 15 of 37 of the Battle for Syria and Lebanon. East Africa: Day 378 of 537 of Italy's East African campaign in the lands south of Egypt. CBI - China: Day 1,447 of 2,987 of the 2nd Sino-Japanese War. USA: V-mail, short for Victory Mail, is sent for the first time, using a process of photographing letters onto microfilm and printing them back to paper upon arrival at their destination. One roll of film contains 1,500 letters to military service members around the world. 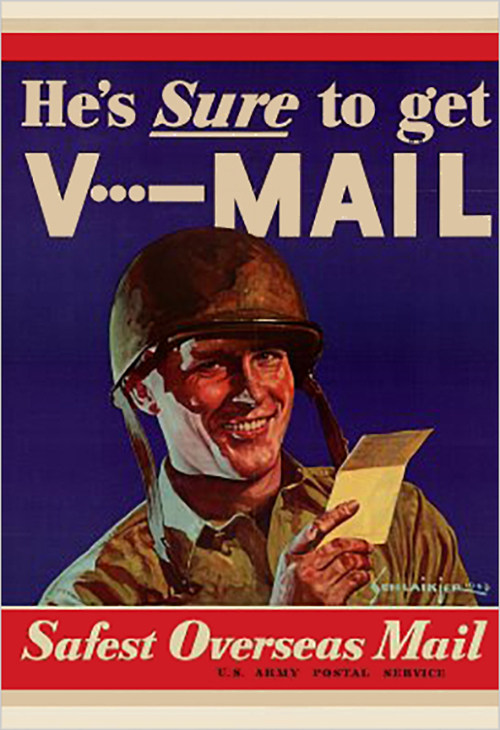 According to the National Postal Museum, "V-mail ensured that thousands of tons of shipping space could be reserved for war materials. The 37 mail bags required to carry 150,000 one-page letters could be replaced by a single mail sack. The weight of that same amount of mail was reduced dramatically from 2,575 pounds to a mere 45." This saved considerable weight and bulk during a time in which both were hard to manage in a combat zone. 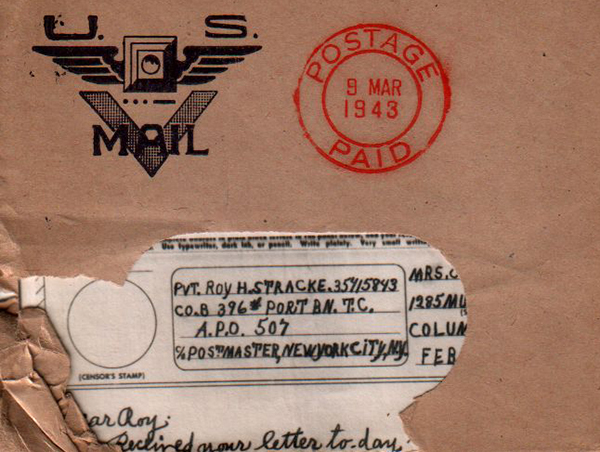 In addition to postal censorship, V-mail also deterred espionage communications by foiling the use of invisible ink, microdots, and microprinting, none of which would be reproduced in a photocopy. The V-mail process was based on an earlier British Airgraph process, invented in the 1930s by the Eastman Kodak Company in conjunction with Imperial Airways (now British Airways) and Pan-American Airways as a means of reducing the weight and bulk of mail carried by air. In case the notion hadn't crossed your mind before, the 1972 advent of "e-mail" was so named as an evolutionary play on the term "v-mail." We can't find anything to back that up, but its a logical enough assumption to be worth spreading as fact. Atlantic: Day 160 of 169 of Germany's Second "Happy Time," during which U-boats sink 609 Allied ships with little risk. Russian Front - North: Day 288 of 872 of the Siege of Leningrad. Russian Front - North: Day 49 of 658 of the Siege of the Kholm Pocket. Russian Front - Center: Day 25 of 31 of Operation KREMLIN, a German diversion to trick the Soviets into thinking Moscow is their main objective instead of Stalingrad and the Caucasus. Russian Front - South: Day 236 of 248 of the Siege of Sevastopol, Crimean Peninsula. The Soviet east line starts to collapse. MTO - Libya: Erwin Rommel is promoted from Lieutenant General to the rank of Field Marshal (Generalfeldmarshall). East Africa: Day 49 of 186 of the Battle of Madagascar. CBI - China: Day 1,812 of 2,987 of the 2nd Sino-Japanese War. Day 39 of 124 of Japan's Zhejiang-Jiangxi Campaign, launched to punish anyone suspected of aiding the Doolittle raiders in China. Roughly 250,000 Chinese will be killed. PTO - Alaska: Day 16 of 435 of the Battle of Kiska, Aleutian Islands. PTO - Malaya: Day 124 of 357 of the Battle of Timor Island. ETO - UK: The British RAF Coastal Command begins anti-shipping missions with their airplanes armed with rockets. ETO - Germany: The RAF bombs factories at Friedrichshafen in southern Germany. Mission planners thought these were factories for producing radar parts, but they were manufacturing parts for V-2 rockets instead. ETO - Germany: US 8th Air Force B-17s make the first large-scale daylight raid on the Ruhr, attacking industrial targets. In the day's second mission, B-17s bomb the former Ford and General Motors plants at Antwerp, Belgium. Eastern Front: The Stutthof Concentration Camp conducts its first gassing, killing many Polish and Byelorussian prisoners. Russian Front - North: Day 653 of 872 of the Siege of Leningrad. Russian Front - North: Day 414 of 658 of the Siege of the Kholm Pocket. MTO - Italy: US 12th Air Force RAF Wellingtons night bomb Salerno. During the day, Beaufighters sink a small vessel off Sardinia. CBI - Burma: US 10th Air Force bombs target at Ywataung and Monywa. CBI - China: Day 2,177 of 2,987 of the 2nd Sino-Japanese War. PTO: Day 27 of 47 adrift in a raft for the survivors of B-24 GREEN HORNET that crashed 850 miles from Hawaii. PTO - Alaska: Day 381 of 435 of the Battle of Kiska, Aleutian Islands. PTO - New Guinea: Day 62 of 148 of the 2nd Battle of Lae-Salamaua. US 5th and 13th Air Forces provide air support. PTO - New Guinea: US Army troops invade the Japanese-held Woodlark Island in the Trobriand Islands off the east coast of New Guinea. PTO - Solomon Islands: Day 3 of 67 of the Battle of New Georgia. Allied troops advance inland. USA: President Roosevelt signs the "Servicemen's Readjustment Act of 1944" commonly known as the "GI Bill of Rights" or simply the "GI Bill" which promises to provide funds for housing and education after the war for all returning US servicemen. In 1944, Don Balfour was an ex-corporal who had just enrolled at George Washington University in DC. The day before the GI Bill had been signed, he checked and found out that he qualified and thus became the first ex-GI to go to a university on the program. The GI Bill was not only a way of thanking the hundreds of thousands of servicemen for their contributions, but it was an investment in America's post-war future. It is quite likely the single most successful government program in terms of its payout to the national economy. Thousands of veterans used the GI Bill to go to school. 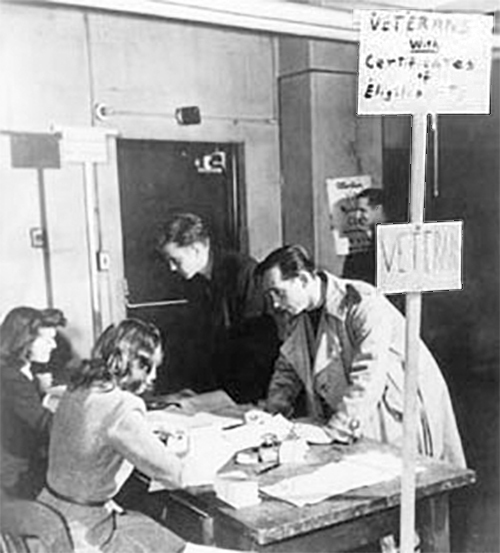 Veterans made up 49 percent of US college enrollment in 1947. Nationally, 7.8 million veterans trained at colleges, trade schools and in business and agriculture training programs. ETO - UK: Day 10 of 86 of the V-1 "Buzz Bomb" offensive on Britain. ETO - UK: Prisoners of the Alderney Concentration Camp in the Channel Islands are moved to Sollstedt in Germany. They will arrive in September 1944 and will be transferred to Buchenwald Concentration Camp. ETO - France: Day 17 of 49 of Operation OVERLORD, the Allied invasion of Normandy, France, known forever simply as D-Day. ETO - France: Day 17 of 62 of the Battle of Caen. ETO - France: Day 17 of 25 of the Battle of Cherbourg. The US mounts an all-out ground attack on Cherbourg. ETO - France: US 8th Air Force bombs V-1 rocket bases in the Pas de Calais area. ETO - Denmark: The communist organized sabotage group BOPA, attacks the Danish arms factory Riffelsyndikatet (the Rifle Syndicate) in Copenhagen. Germany: Claus von Stauffenberg meets with representatives from German communists in eastern Berlin, Germany, not knowing one of them is a Gestapo spy. Russian Front - Finland: Day 2 of 50 of the Battle of Karelia. Soviet troops continue their offensive against the Finns in eastern Karelia between Lake Ladoga and Lake Onega in northern Russia. Russian Front - North: Day 142 of 191 of the Battle of the Narva Isthmus, Estonia. Both German and Soviet troops remain locked in their defensive positions. Russian Front - South: The Luftwaffe makes a night raid on the USAAF base in Poltava, Ukraine, destroying 44 B-17s and 500,000 gallons of fuel. MTO - Italy: Day 7 of 34 of the Battle of Ancona (north of Rome). Allied Air Forces provide air support. CBI - Burma: Day 110 of 166 of the UK's Operation THURSDAY. The Chindits begin an offensive on the Japanese at Mogaung in northern Burma. CBI - Burma: Day 105 of 147 of the Battle of Myitkyina. US 10th Air Force provides air support. CBI - Burma: Day 83 of 302 of the Chinese Salween Offensive. US 14th Air Force provides air support. CBI - China: Day 2,543 of 2,987 of the 2nd Sino-Japanese War. Day 67 of 259 of Japan's Operation ICHI-GO. Day 1 of 48 of the Battle of Hengyang. The Japanese mount an attack to take this city. CBI - India: Day 107 of 118 of the Battle of Imphal-Kohima. The British 2nd Division and Indian 5th Division link up on the Kohima-Imphal road, ending the siege at Kohima. The Indian 6th Brigade from Kohima hooks up with Indian 9th Brigade from Imphal on the section of Imphal-Kohima Road that had been held by the Japanese. PTO - Caroline Islands: US 7th Air Force bombs targets in the Truk Atoll and on Ponape Island. PTO - Mariana Islands: Day 8 of 25 of the Battle of Saipan. PTO - New Guinea: Day 27 of 83 of the Battle of Biak. 5th Air Force provides air support. PTO - New Guinea: Day 191 of 597 of the Battle of New Britain. US 13th Air Force provides air support. PTO - New Guinea: Day 62 of 481 of the Battle of Western New Guinea. 5th Air Force provides air support. PTO - New Guinea: Day 9 of 80 of the Battle of Lone Tree Hill. PTO - Solomon Islands: Day 235 of 295 of the Battle of the Bougainville Islands. US 13th Air Force provides air support. CBI - China: Day 2,908 of 2,987 of the 2nd Sino-Japanese War. Day 83 of 91 of the Battle of Zhijiang. US 14th Air Force provides air support. Japanese troops continue pulling out of China. PTO - Borneo: Day 13 of 67 of the Battle of North Borneo. US 5th and 13th Air Forces provide air support. PTO - Japan: US 20th Air Force B-29s bomb the Kure Naval Arsenal, the Mitsubishi aircraft plant at Tamashima, the Kawanishi aircraft plant at Himeji, the Mitsubishi and Kawasaki aircraft plants at Kagamigahara and the Kawasaki aircraft factory at Akashi. PTO - Japan: Day 83 of 83 of the Battle of Okinawa. All organized resistance ends after some of the bloodiest fighting in the Pacific, during which 98,654 Japanese have been killed and 6,922 captured. The US loses are 6,990 killed and 29,598 wounded. PTO - New Guinea: Day 543 of 597 of the Battle of New Britain. US 10th Air Force provides air support. PTO - New Guinea: Day 427 of 481 of the Battle of Western New Guinea. US 10th Air Force provides air support. PTO - Philippines: Day 245 of 299 of the 2nd Battle of the Philippines, aka the Liberation of the Philippines or the Philippines Campaign. PTO - Philippines: Day 190 of 244 of the Battle of Luzon. 5th Air Force provides air support. US troops capture Aparri. PTO - Philippines: Day 105 of 159 of the Battle of Mindanao Island. 5th Air Force provides air support. PTO - Philippines: Day 97 of 135 of the Battle of the Visayas region. US 5th and 7th Air Forces provide air support. Poland:The trial against Arthur Greiser at the Supreme National Tribunal of Poland begins. Greiser had authorized the formation of SS detachments that essentially acted as mobile execution squads that murdered Jews, mental patients and other groups deemed subhuman by the Nazis. The Nazis did all they could to keep the Jewish godfather of the German compact car out of the history books. The heavyweight fights in 1936 and 1938 between Joe Louis and Max Schmeling symbolized the hopes, hatreds, and fears of a world moving toward total war. In-depth interviews with survivors of the 445th Bomb Group's deadly 27 Sep 44 Kassel Mission, which suffered the largest loss by a USAAF bomb group on any mission in WWII.